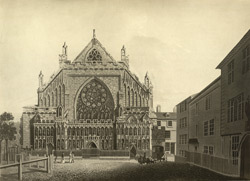 View of the west front of Exeter Cathedral in Devon, which was rebuilt in the Decorated Gothic style. The west front of a cathedral was often the last portion to be built and was meant to impress as it was the chief entrance into the cathedral. This west front has three stories. The basement storey has a screen which is covered in canopied niches holding figurative statues. The next storey has a large arched window and the walls of the nave on either side slope downwards. Then at the top is the gable at the nave with a smaller arched window.